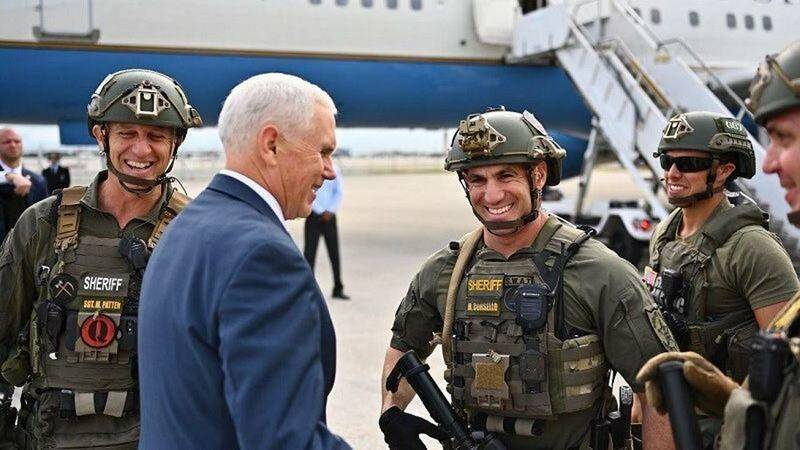 FORT LAUDERDALE, Fla. - A Broward County Sheriff's Office deputy has been demoted after he was photographed wearing a QAnon patch while meeting Vice President Mike Pence last week. Broward County Sheriff's Office spokeswoman Veda Coleman-Wright said the Sgt. Matt Patten was not authorized to wear the patch, which read "Question the Narrative." QAnon is a far-right conspiracy theory popular with a small group of supporters of President Donald Trump. At a July Trump rally in Tampa, some rallygoers sported QAnon shirts and signs. Patten received a written reprimand on Monday. He was also removed from the Sheriff's Office's Strategic Investigations Division's Office of Homeland Security and from the agency SWAT team, Coleman-Wright said. Patten will be reassigned to the Department of Law Enforcement, she said. Broward Sheriff's Office deputies greeted Pence at Fort Lauderdale-Hollywood International Airport on Friday after the vice president attended an event in Hollywood. The vice president's staff took photos of the meet-and-greet and posted them on Twitter. Pence's staff deleted the tweet after news outlets reported about the patch. Patten was cited for conduct unbecoming an employee and called #QAnon controversial. "For this event, SWAT Team Leader Sgt. Patten intentionally placed an unauthorized symbol/patch onto his agency issued SWAT vest to meet and pose with (Vice President) Pence," the reprimand states. "Sgt. Patten's actions of displaying unity with a controversial group not in alignment with the core values of law enforcement and the Broward Sheriff's Office discredited the agency, the country and himself." The QAnon movement has been called everything from "a deranged conspiracy cult" to a grassroots movement "about the covert battles being waged between the deep state and President Trump." The group is named for "Q," an anonymous person who claims to be a member of the U.S. military intelligence.